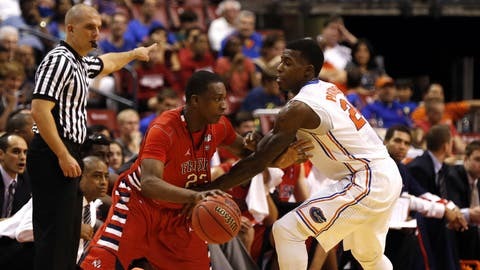 Florida Gators forward Casey Prather (24) guards Fresno State Bulldogs guard Marvelle Harris (23) in the second half at the BB&T Center. SUNRISE, Fla. (AP) — The Florida Gators kept making Fresno State miss, and kept grabbing rebounds. Eventually, the Gators started to sink some shots, too. No. 16-ranked Florida won with defense Saturday, allowing its lowest point total of the season to beat Fresno State 66-49. Florida held the Bulldogs to 32-percent shooting, a season-best by the Gators. Fresno State went 4 for 17 from 3-point range, including a basket from near midcourt at the final buzzer. "This was probably our best game defensively from start to finish," Gators coach Billy Donovan said. "I was happy with the way we guarded. They weren’t able to score quickly on us. They had to go deep into the shot clock. Casey Prather scored 16 points for the Gators (9-2), who had a 47-24 advantage in rebounds. Prather was voted the game’s most valuable player. Fresno State (6-6) lost its third game in a row and fell to 1-5 away from home. "It was an honor to come in here and compete against one of the best teams in the country," coach Rodney Terry said. In the first game of the doubleheader, No. 22 Massachusetts lost to Florida State 60-55. The Gators went 1 for 13 from 3-point range in the first half, but thanks to their defense, they still led 23-19. Defense was an area Donovan emphasized in practice after Florida gave up 75 points Tuesday in a win over Memphis. "We did a great job doing things we’ve been trying to do in practice," Prather said. "We’ve just been trying every day to stay hungry as possible to get better on defense and become great defensively. While Fresno State missed 34 shots, the Bulldogs had only nine offensive rebounds. The Gators’ edge on the boards was by far their largest this year. "We knew going in that on the glass they’re a monster to deal with," Terry said. Florida’s Will Yeguete had five offensive rebounds and a season-high 10 total. "The most underrated guy tonight was Will," Donovan said. "He was awesome. Scottie Wilbekin had 11 points and Yeguete nine for the Gators, who won away from Gainesville for the third time this season. Patric Young, who didn’t start because of a sore knee, contributed eight points and nine rebounds. The Gators shot 29 percent in the first half and 58 percent in the second half. "It was a tale of two halves," Donovan said. "We hung in there with our defense. Michael Frazier II, Wilbekin and Kasey Hill each sank a 3-pointer as Florida outscored Fresno State 15-4 to start the second half and open up a 15-point lead. A basket by Yeguete made it 55-35, and the margin reached 26 with 2:40 left. The Gators finished with 20 offensive rebounds. "That helped us a lot, because in the first half we missed a lot of shots and kept getting the ball back," Yeguete said. "That helped get us going. Cezar Guerrero had 17 points for Fresno State. Paul Watson and Marvelle Harris added 10 each, but the Bulldogs’ bench totaled only four points. None of four teams in the doubleheader shot better than 42 percent, and players complained of unforgiving rims in the arena, which is used mostly for hockey. "I looked at them as street-ball rims — really hard," Guerrero said. "You really needed a swish to get it through the hoop."